During this time of year, it can be pretty tough to find the motivation to train. There’s Christmas and all that goes with it – the shopping, the eating, the baking, the Christmas cards, the wrapping, the eating, the traveling, the eating, etc. It’s also getting cold in a lot of places. And with cold comes snow and ice. On top of all that, the hours of daylight have diminished drastically. Add all of this together and it can be very difficult to find the motivation to train for adventure racing (or for any endeavor for that matter). Well, in this series of posts, I’ll be sharing with you how I like to stay motivated over the long, harsh winter. When training for any endurance sport, you might find yourself training alone most of the time. While that’s often necessary, training socially has really helped stoke my motivational fire, and it just makes training much more enjoyable. If you can find a group willing to train with you in the snow and mud, you’ll be fine all winter long. Now when I say “train socially,” I’m not just referring to meeting some friends for a run or ride, although training with friends is a fantastic way to stay motivated. We try to train with friends and teammates as much as possible, but training socially also includes joining a running or cycling club where you might learn something from other more experienced athletes. And who knows? Maybe you can help someone else who might have less experience. Either way, it makes training that much better. You can use the internet to “train socially” even if you’re a recluse who lives in the middle of nowhere with no friends, clubs, or teams within hundreds of miles. How? I’m glad you asked. There are also Challenges on Dailymile to keep you motivated. You’ll find anything from “Fastest 5K in January” to “Cycling 1000 Miles in 2013.” Don’t worry, though. There are enough challenges to suit anyone’s abilities and interests. For the slightly more competitive person, Strava might be a better option. Like Dailymile, Strava allows you to upload your rides and runs, but you can do so directly from your GPS like a Garmin or your smartphone using the Strava App. 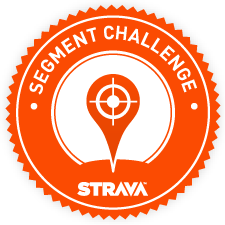 Each climb on your route is recorded as a “Segment,” and you can see how you rank on each segment compared to others on Strava. If you work hard enough, you might eventually become the King or Queen of the Mountain (KOM/QOM). I’ll just mention one more thing to help keep you motivated to train through the winter: Virtual Races and Virtual Events. I guess that’s’ two more things, but they’re basically the same thing. Here’s a nice, short blog post on what a Virtual Race is. A Virtual Event is much like a Virtual Race, only there is no real “winner,” and it’s much less competitive. We at Team Virtus put on an event called the Super Century in Februrary on Super Bowl Sunday. The idea was to see who was stupid brave enough to hop on their indoor trainer (or go outside if no trainer was available) and ride a metric century (100 Km or roughly 62 miles) before the Super Bowl. We had WAY more people participate than we ever dreamed possible. We updated each other on facebook and twitter which really made the ride a lot more fun, and it seemed like we were all doing it together even though some of us were thousands of miles away. Enough people were participating and tweeting that #SuperCentury was actually trending in the St. Louis area. That’s just crazy. We’re dumb enough to do another Super Century, so if you’re interested in participating, be sure to keep an eye on our team page for more info. And there you have it. The first tip to stay motivated this winter is to train socially. Stay tuned for more tips.